For four years after her return from Rome, St. Rita suffered more pain from the wound on her forehead than before she made the journey to Rome, so that her life became really a martyrdom. Moved with compassion for her suffering, or pleased with her wonderful patience, the Son of God came from Heaven to visit and console her with His Divine presence. This Divine visit filled the soul of St. Rita with extreme delight and gratification, and her heart was so consumed by the words of her divine Spouse, that, having sunk her understanding in the extreme bliss she enjoyed from gazing on the Divine beauty of Jesus, she would have broken the earthly bonds that detained her soul in the prison of her body, to enjoy forever the happiness she saw, were she permitted to do so. St. Rita gazed attentively at her beloved Spouse, who, like a flower from the Heavenly paradise, and a lily from the celestial valleys, invited her to satisfy her thirst and fill her heart with delights by enjoying the sweetness His Divine presence cast around her. But recognizing that the ocean of happiness in which she was engulfed was only temporal, and thirsting to enjoy the eternal, she ardently desired to follow her Divine Spouse, who disappeared from her view after He had given her a foretaste of what His chosen ones enjoy in Heaven. After Our Lord had disappeared, there remained in the heart of St. Rita so deep a wound that she became so ill with Divine love, suffering so violent an attack of fever, that she was obliged to betake herself to her poor and hard bed, whereon she lay, more dead than alive, without anyone knowing the cause of her illness. Thus for four long and weary years, St. Rita suffered the pains of love, in order that the gold of her patience might be refined and that she might make a new ring, set with the most precious jewels, which she would wear at the celebration of her espousals with her Divine Lord when she made her entrance into the Kingdom of His glory. Besides the pains of her illness, she suffered the torments of the wound on her forehead, and these torments were made more poignant by the continual movements of the little worms which had also increased in number. 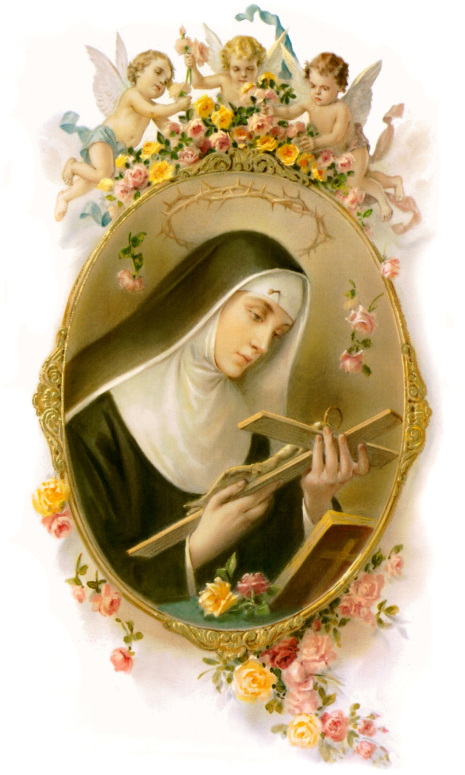 But anxious to suffer more and more, St. Rita bore every pain of her agony with the most admirable patience, and during all the years of her illness, she never uttered a single sigh or word of complaint, but respired rather, in all her actions, the celestial love that was consuming her heart with the flames of the Divine fire. Having become ill with Divine love, because her beloved Spouse had left her after a short visit, St. Rita experienced a love, strong as death, which, however, did not take away her life but rather spared it, so that she actually suffered the pains and agony of death without dying. However, in the midst of all her afflictions, St. Rita sought no human relief. Her chief delight was to feed her soul and body with the Bread that came down from Heaven, and to quench her thirst with the bitter chalice of the Passion of her Divine Spouse, Jesus Christ. Thus for four years her life was really miraculous, nourished only by the Body and Blood of Jesus Christ. To show how dear St. Rita was to her Divine Spouse and to make manifest the fact that St. Rita can obtain even the impossible from God, if she asks it, Divine providence disposed her, while she was ill, to ask that a flower and two figs be brought her from the little garden which St. Rita at one time owned and cultivated with her own hands-----a garden which could be truly called the inheritance of God, and the garden of her Heavenly Spouse, because she had sold it before entering the convent and had distributed the proceeds amongst His needy poor. One day in the month of January, a cousin of St. Rita's came to the Maddalena Convent to visit her. The visit was a short one, for that particular day St. Rita was very ill and suffered much. On taking her leave, her relative asked St. Rita if she could do any favor for her. "Yes, Cousin," said the Saint; "bring me a rose from the garden of my old home in Rocca Porrena." St. Rita's request surprised her cousin, who thought that perhaps her mind was affected by her illness, and besides, as it was midwinter and the climate of Rocca Porrena exceedingly cold, her relative and the nuns who were in attendance could not be persuaded that the rose could be found. Nevertheless, to humor the Saint, her cousin told her that she would try to fulfill the errand, though she thought it would be impossible to find what she asked for. St. Rita responded: "My dear cousin, there is nothing impossible to God." The security with which St. Rita spoke these words determined her cousin to set out at once for Rocca Porrena, and to her great astonishment and amazement, on entering the garden she saw, on a sapless and leafless rosebush, a beautiful red rose in full bloom. She plucked the rose, and returned to Cascia as quickly as possible and gave the rose to St. Rita. The Saint received the rose with great joy and gladness, and a heavenly smile lighted up her countenance as she kissed it reverently, while her heart gave thanks to God as she contemplated in that rose her sweet Jesus crowned with thorns. St. Rita then handed the miraculous flower to the superioress, and from her hand it passed into the hands of all the nuns, who, after admiring its marvelous beauty, returned fervent thanks to God, who, to make manifest the sanctity of their beloved sister Rita, had caused a most beautiful rose to grow in the midst of a cold winter. To commemorate this miraculous event, roses are blessed each year in all the churches of the Augustinian Order on the feast of St. Rita and distributed to the faithful. Shortly after the miracle of the rose, God wrought another miracle at the request of St. Rita. On the occasion of another visit to the convent, in the same month of January, St. Rita asked her cousin to go and bring two figs she would find on a certain frozen fig tree in the garden of Rocca Porrena. This time, without the least doubt in her mind, the woman hastened to bring the figs. She had no difficulty in finding the tree St. Rita had described, and on it were two ripe and luscious figs. With no less joy than admiration at seeing this second miracle, she picked the figs and brought them to St. Rita. St. Rita received the figs with the greatest joy, and again did the nuns thank and praise God for having qualified, for the second time, the sanctity of their holy and beloved sister. But St. Rita, elevating her spirit to a contemplation of the mysterious, considered the two miracles a warning that the time was near at hand when she would pass from this life, to enjoy for all eternity the incorruptible flowers and seasoned fruits of the Celestial paradise.